Novík was a protected cruiser in the Imperial Russian Navy, built by Schichau shipyards in Elbing near Danzig, Germany. 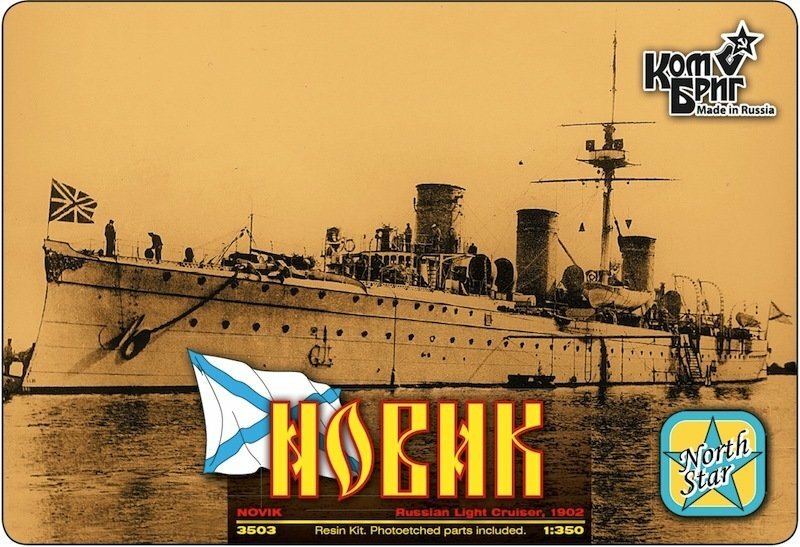 The Novik performed heroically in various engagements during the Russo-Japanese War of 1904-1905. One of the few ships in the Russian fleet to offer combat during the initial Battle of Port Arthur, it closed to within 3,000 yards of the Japanese fleet to deliver a torpedo. In the Battle of the Yellow Sea, the Russian fleet attempted to run the Japanese blockade of Port Arthur. The attempt failed, and most of the Russian ships returned to port but several managed to escape to be interned in various neutral ports. The Novik reached the neutral German port of Tsingtao in company of the battleshipTsesarevich, but choosing to avoid internment, Commander Maximilian Schultz chose to outrace its Japanese pursuers around the Japanese home islands towards Vladivostok. The Novik was pursued by the Tsushima, which was later joined by the Chitose. Spotted by a Japanese transport ship while coaling at Sakhalin, Novikwas trapped in Aniva Bay, near Korsakov, Sakhalin on 7 August 1904. Realizing that he was hopelessly outgunned and after sustaining considerable damage, Commander Schultz ordered the Novik scuttled to make salvage impossible. Nevertheless, the Japanese thought highly enough of the vessel to seize it as a prize of war, and it was repaired and commissioned into the Imperial Japanese Navy as the Suzuya. It was declared obsolete and scrapped in 1913.